Before & After we ripped out the carpet. With the recent purchase of our new home there was a lot of items that either needed to be replaced (like ALL the interior doors) or painted (try EVERYTHING!) 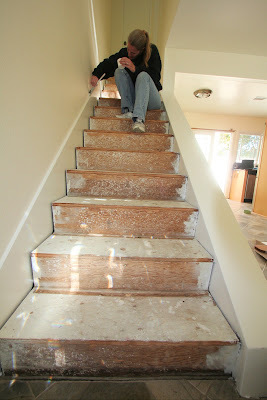 and last but not least the upstairs carpet (which was ripped out and burned) okay just ripped out. 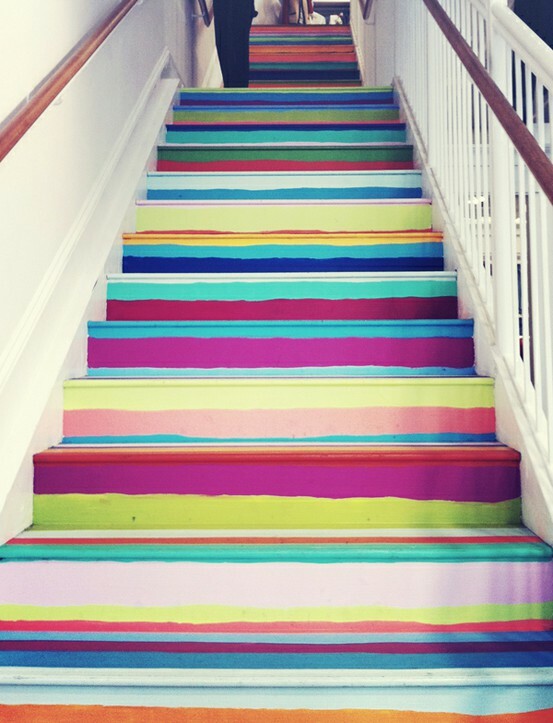 I knew we would replace the carpet in the rooms upstairs but what about the stairs???? I absolutely did not want to re-carpet them. 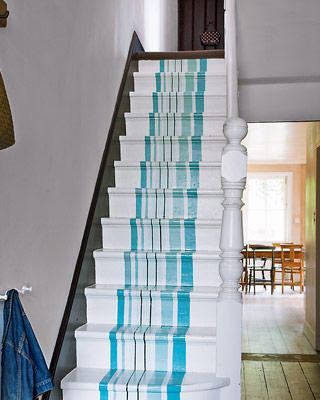 My whole theme for this house was to "go coastal". If we were going to live by the beach we needed to make a full commitment to the "beach look" which I felt meant an update rather than more carpet. As my husband repeated over and over, "It would be easier to clean and cheaper to do if we just stuck with carpet" I constantly reminded him of the "look" we were going for. The finished look I told him would be worth the extra money. 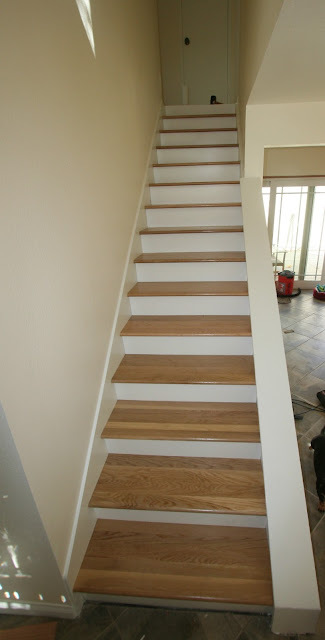 Since we are determined DIY'ers I found a company online that would sell us the unstained oak retro-treads and unpainted risers, we could stain, varnish and paint them ourselves. 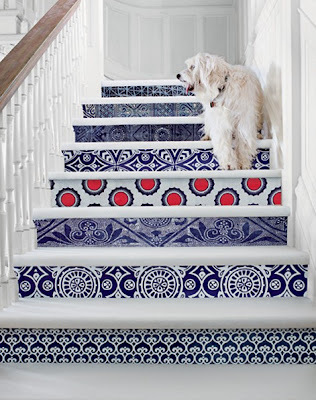 Retro style stair treads and risers are designed to be installed over existing stairs and this style of tread and riser can be installed over an existing stair without removing the old step treads or stair risers. The difference between our retro treads and our traditional 1" stair treads is the method of installation. Our retro treads are not intended to be a a stand-alone installation and need to be installed over an existing stair tread while our traditional 1" stair treads are designed to be used in new installations or in applications where the existing step tread will be removed and replaced with the new step tread. As for installing...we could do that as well. After staining and varnishing and painting everything we were ready. After a few bumps and a slow start we got into a rhythm. It is definitely not a "weekend warrior" project. 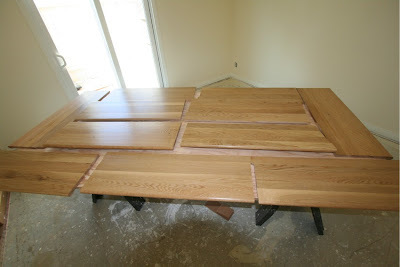 It does take time for stain and varnish to all dry, not to mention the 5 coats of varnish! After. I think they came out smashing! After all was said and done we both agreed that our choice was the right one. No carpet! 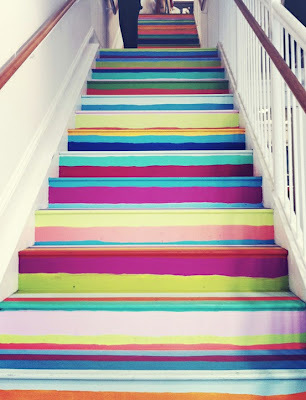 I have some wonderful stair ideas below that show what you can do with stairs besides carpet and they take only time and a little bit of money. 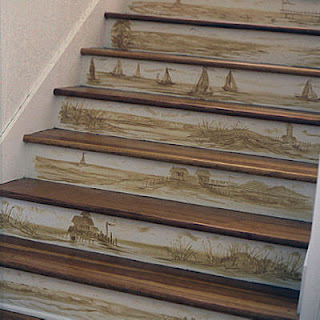 or how about a roll of wallpaper! 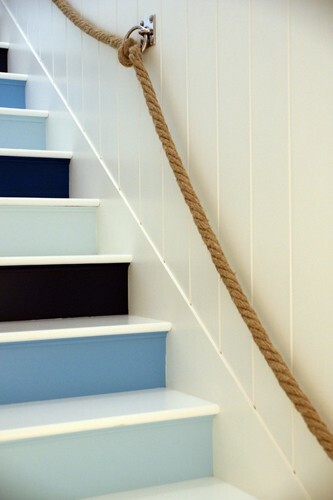 Love the shades of Blues and the Rope railing, so Nautical! They came out beautiful! I have never heard of this type of product be fore. 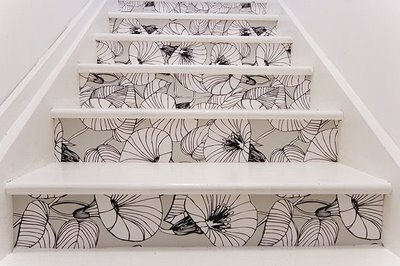 What a good idea. Thanks so much! It was well worth it!